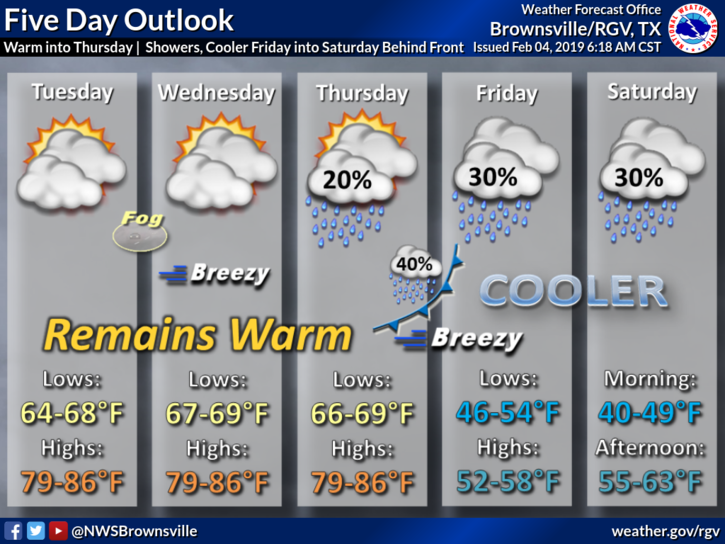 Temperatures are expected to be well above average across the Rio Grande Valley on Monday, according to the National Weather Service in Brownsville. After some morning fog, it will be a partly sunny, mostly cloudy day for the region with temperatures in the 80s. Brownsville will see 80 while McAllen will hit 82. Port Isabel, however, will only reach 71. Looking ahead, Tuesday through Thursday the Valley will see highs in the 80s with the possibility of upper 80s. A cold front is expected to arrive late Thursday, dropping high temperatures into the 50s and lows into the 40s. The cold front is expected to bring windy conditions and a chance for rain.